This week was a busy one, I had to shop in our new city. Brutal! LOL I love to shop and explore so every day I went out into Rapid City and found new shops, winter items for the kids before they are sold out, and a few shops that will take my artwork on consignment! What fun and I did not even reach 1/4 of the downtown area yet, so many places that I never knew were there! So crafting took a back seat and last night I finished up my two envelope cards using Ppinky Dolls with Distressed Inks and Derwent Inktense pencils. 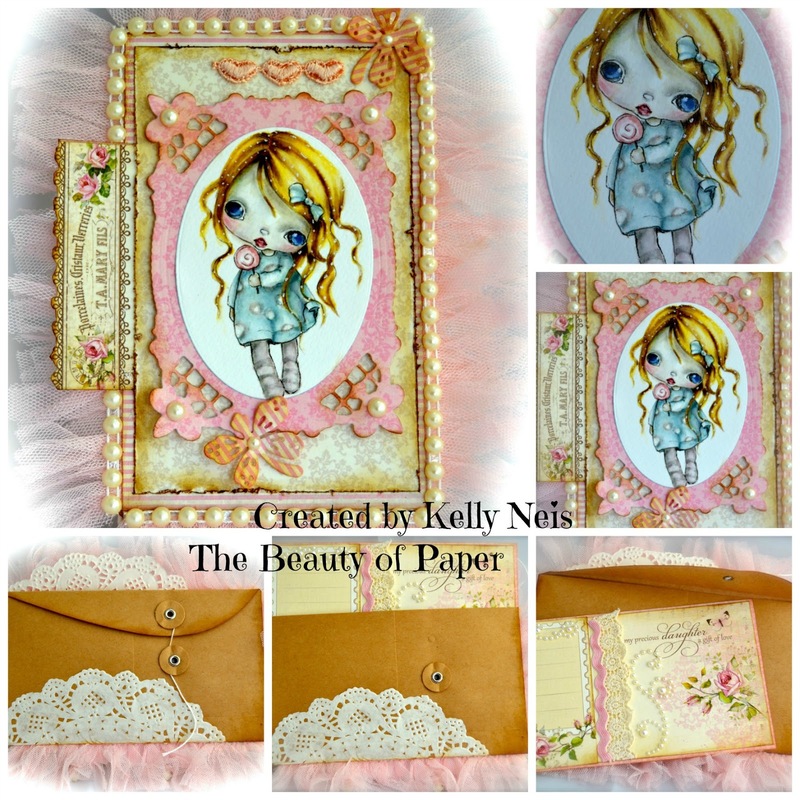 Using Pion papers, "My Precious Daughter" and a envelope I have had for many years, I created 2 cards. Lilith is colored with Inktense pencils and then Distressed Ink and Inktense pencils for the background. The front of the card is mounted onto the envelope. Turn it over and you can see the back of the envelope and the inside sentiment card I created to go with. The envelope is small 4x7 and has twist around tie on the back. She was also colored with Inktense pencils and I used a Gelly Roll pen for her hair. I made a pocket on the left side for another pull out piece you can use for a message on the front. The back shows the same 4x7 envelope and a doily glued onto it. The inside sentiment card is on the bottom right. Wishing you a very happy weekend!! I hope to relax and craft, yeah! I'm gasping with excitement! I took a few weeks off from blogging and now here I am on your blog and I can't believe what I've missed. SO much stinking FUN and gorgeousness to take in. You are incredible with every bit you touch. Absolutely in awe of your coloring, your design layouts and your outcomes....just breath taking my friend!!!! Happy weekend to you and I hope to not fall so behind again for awhile. However, the break was nice. Happy you had fun Kelly !! 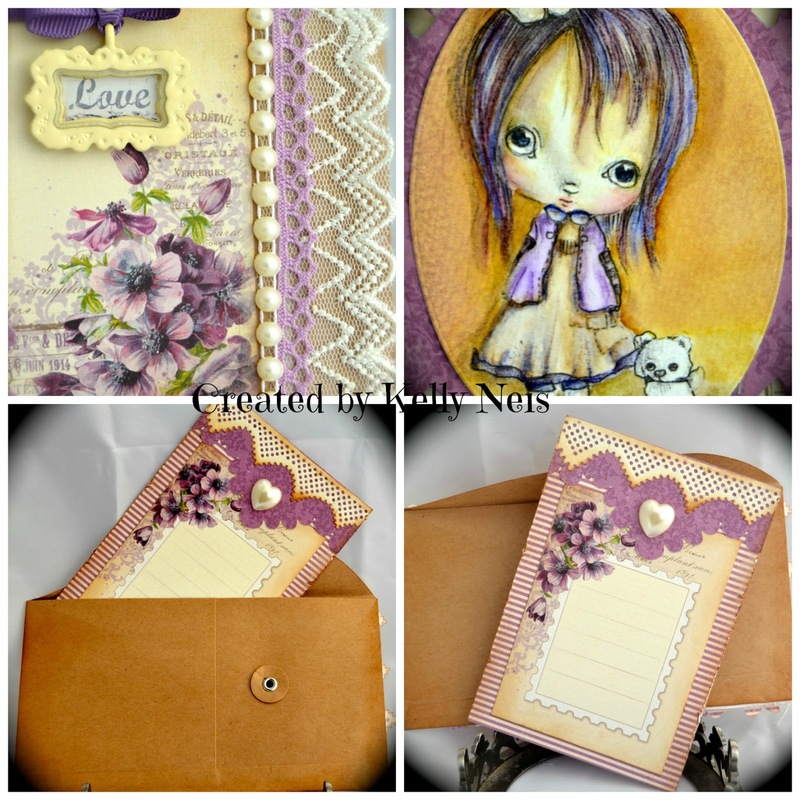 Fab creations, as laways, so beautiful ! Kelly, absolutely phenomenal works of art!!!!! 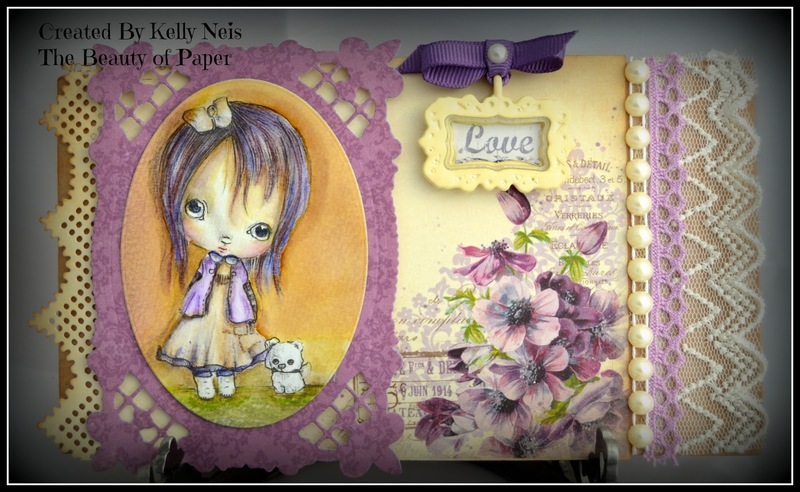 Your coloring is outstanding and I love the gorgeous papers and embellishments! Those images are just so darn cute and precious! So happy you found an outlet for your artwork! Hello Kelly! I just went Ah.......... when I read that you did some early shopping to make sure you find items for winter. OMG. we are only in september, and I remember this rush when my kids were small.... your card is wonderful. Love this pretty image very much. such a pretty style of card... Everything is gorgeous! Hugs. glad you are enjoying exploring your new city… sounds exciting! Two beautiful cards and envelopes. Lovely coloring and yummy details. How exciting to explore new shopping sites!! I think your new location is working out well. I'm so happy for you. I'm loving these images and you did a fab job on this card. As usual, your colouring and design are flawless!